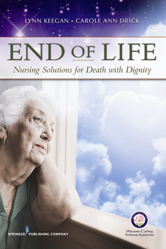 This professional clinical guide presents nursing administrators and nurses in acute care agencies, nursing homes, hospice, and palliative care settings with detailed implementation strategies for accommodating dying persons and their loved ones as they make the transition from physical life. It presents the need for and the development of the concept: Golden Room concept: a place for dying that facilitates a dignified, peaceful, and profound experience for dying persons and their loved ones. This book presents a practical solution on multiple levels that will benefit all involved-patient, family, nurses, administrators, policy makers, and insurance companies. It presents the theoretical frameworks for end-of-life care and how the Golden Room concept fits into these frameworks.